RAIL Back On Track (http://backontrack.org) a web-based community support group for rail and public transport and an advocate for public transport passengers has called on Queensland Rail to be sensitive to local concerns as it pushes ahead with planned closures of Open Level Crossings on the regional rail network to ensure compliance with nationally-recognised safety standards. Robert Dow, Spokesman for RAIL Back On Track said: “While safety should always be the number one priority for operating trains and managing tracks across the Queensland Rail network, all the alternatives need to be explored, including making existing crossings safer, before a unilateral decision is made to close at-grade paths over rails as the easiest option to make them safe. “The practical consideration of working railway towns and how people access their railway station or get about, including where tracks bisect a community, needs to be thought through to ensure that closure of open pedestrian pathways don’t affect connectivity and the economy of towns where people still find it convenient to walk or cycle to where they want to go. “The various state transport agencies should take care that their strategies do not conflict with each other – active transport initiatives and guidelines governing Transport Oriented Developments, as well as town plans and footpath grids. We have seen elsewhere the consequences of uncoordinated planning and actions between Transport and Main Roads (TMR) and Queensland Rail. “This matter has come into sharp focus at Pomona (1), in the Noosa Hinterland, where a mid-town pedestrian pathway that has linked both sides of the town for more than 100 years is slated for closure by Queensland Rail, yet there has been no reported incidents of death or injury there for the past decade. A real opportunity exists to make the current pathway safer, linked to the proposed upgrading of the temporary railway station to a permanent structure. It represents a significant opportunity to unify the town and not divide it by sending people out of their way to cross the North Coast Line at the busiest traffic point in Pomona. I agree. Exacerbating the physical division of a community such as Pomona with reduced accessability would be tragic. There doesn't need to be more encouragement to drive rather than walk by making walking routes more inconvenient. GROUP of residents are fighting a Queensland Rail proposal they say will divide their coastal town. Pomona man Brian O'Connor is leading the newly-formed Don't Divide Pomona group in an effort to avoid a railway pedestrian crossing being shut off. The pathway runs between the Majestic Theatre and the Pomona Hotel, past the Pomona Railway Station. "The pathway has served Pomona for more than 100 years and no one in town can recall a death or injury in the years it has operated,” Mr O'Connor said. 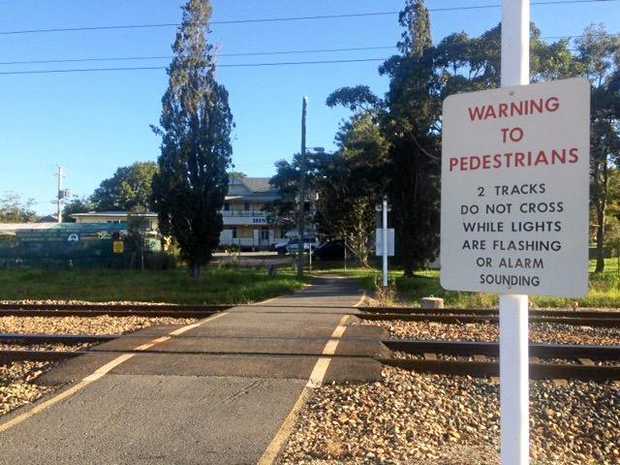 A Queensland Rail spokeswoman said the current pedestrian crossing would require a significant upgrade to ensure its compliance with national safety standards. "In consultation with Noosa Council and the Department of Transport and Main Roads, we are investigating possible footpath and road crossing options to ensure pedestrians have a safe passage to the two other nearby formal crossings at Reserve St and Subway Ave,” the spokeswoman said. She said Queensland Rail would conduct a number of consultation activities in the coming weeks. Petitions against the proposed closure have already been distributed to more than 10 Pomona businesses to collect signatures. Mr O'Connor said Queensland Rail had been very cooperative in consulting the community about the new railway station but silent about the cross-town pathway. "We see them as linked, as the railway station and its associated pathway are the lynchpin to the connectivity of what is a very walkable town,” he said. He said Queensland Rail's solution of diverting the pedestrians, cyclists and horse riders to the Reserve St crossing was not suitable. "This is the busiest traffic point in town. "The Reserve St crossing point has poor connectivity to the rest of the path network servicing the town. He said the railway station crossing had overhead lighting, prominent warning signage, flashing yellow warning lights and a klaxon that sounded an audible warning. Explore all options before closing Open Level Crossings through railway towns. 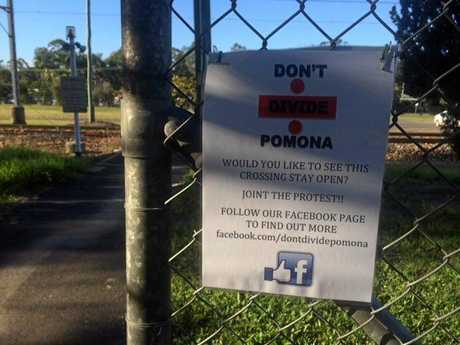 The dontdividepomona Facebook page is reporting that 1364 signatures have been obtained in protest against the closure of the path over the tracks at Pomona - not bad for a town of 2700 people! The protest rally and march is to be held tomorrow. It will be interesting to see how many locals turn up, given the enthusiasm with which they have signed the petition. Why are they closing this, but Legeyt St stays open? Please pass on our support and best wishes for a successful outcome! Such a friendly little town – yet QR has got the locals marching to the streets – literally – over their stupid plans that people say will have adverse impacts on their safety. Stop in have a coffee, take the history walk, just don’t mention QR. 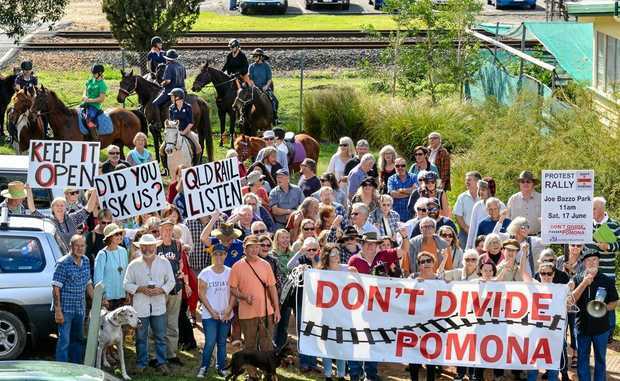 A MOVE by Queensland Rail to divide Pomona by closing a cross-town path that has served the community since 1911 has had the effect of uniting residents in determined defiance. The normally sedate streets of the friendly village reverberated with chanting "Don't Divide Pomona!” on Saturday when 130 marchers, some on horseback, waved banners and placards protesting the planned closure of the pedestrian and cycle path linking the east and west sides of town across the railway tracks. It is the point where three of the walks on the Noosa Trail Network intersect. QR has assessed the path as unsafe. Old-timers say they can't remember a death or any injury involving trains striking pedestrians or cyclists at the location. QR is resisting calls to provide the data on which its decision is based. By the end of the day, the protesters had won a small concession. The CEO of QR, Mr Nick Easy, advised residents on May 18 "closure of this high-risk pedestrian crossing is the best way to eliminate safety risks”, meaning that a decision to close had been made. However, in a late email to rally organisers, a Queensland Rail spokesperson said QR was committed to understanding and considering the views of the community. "We will be undertaking thorough consultation to better understand the impacts this crossing closure may have on those who use it, and to present options for alternative, safe crossing connections,” she said. A decision to close the crossing would not now be made until the community consultation, to be held in mid-July, after the school holidays. The most passionate protester on the day was the youngest, three-year-old Myles Corcoran. Not yet able to read, he cried when his mother read him a newspaper story announcing that QR intended to close the railway footpath both use to access town. Mum explained that he no longer could accompany her on his bike, as she considered the alternative crossing dangerous. A resolution passed unanimously at Saturday's rally in Joe Bazzo Park called upon QR to keep open the existing path via the railway station and to make it safer. Pomona residents also want State Government agencies and Noosa Council to develop a combined plan that ends bickering and blurred lines of responsibility for roads, footpaths and public spaces in town. It seems Noosa Council is now on board, backing the community. Wow, QR seems to have stirred up a hornet's nest in Pomona -- the little village that's fighting back! On 10 August 2017, Mr Glen Elmes MP, the State Member for Noosa, raised the issue of the Pomona railway pedestrian crossing in the Queensland Parliament. Here is a transcript of what Mr Elmes said. Mr ELMES (Noosa—LNP) (5.48 pm): “I rise tonight to register my support for the community of Pomona, who strongly reject plans by Queensland Rail to potentially close Pomona’s railway foot crossing, a crossing that has connected the town for more than 100 years. On Tuesday I submitted the ‘Don’t Divide Pomona’ petition, which has been signed by 1,498 residents—more than half the country town’s population—sending the message loud and clear to Queensland Rail that their pedestrian crossing must be retained. The foot crossing connects the community with the main street where residents work, shop, dine and connect. It is located where it is because it evolved from a logical access and the natural flow of daily local life. “In 100 years there has not been an accident or an injury at the crossing. Given the role the crossing plays in ensuring Pomona’s social cohesion and economic prosperity, it is not surprising that the community came together in protest. In June I joined with 140 locals in support of the retention of the existing crossing. A Facebook group was created, a petition launched, meetings were held and soon the words ‘Don’t Divide Pomona’ were on everyone’s lips. In Queensland Rail’s first hour of community consultation last Saturday, 70 people arrived to express their concerns. Queensland Rail has suggested an alternative crossing could be at the far end of town where money was wasted on an existing vehicle crossing a few years ago. This is not a viable or safe option and would achieve a chaotic and dangerous convergence of pedestrians, cyclists, mothers with prams, dog walkers and horse riders mixing with cars and trucks, without any paths connecting and providing a safe corridor for any of them. Public submissions closed on 14 August. The people of Pomona pass the time awaiting QR's decision about their cross-town path. Queensland Rail has informed the residents of Pomona that it is "preparing a report to reflect the issues raised, and the views shared, during the consultation period." It would appear that closure of the pedestrian path across the tracks via the railway station still remains an option. QR is committed to working with the community to find a solution which balances the need for safety and the desire to provide a crossing that meets the towns requirements, now and into the future. It anticipates that a decision on the future of the Pomona pedestrian crossing will be made before the end of the year. Pomona is due to get a new railway station next year. 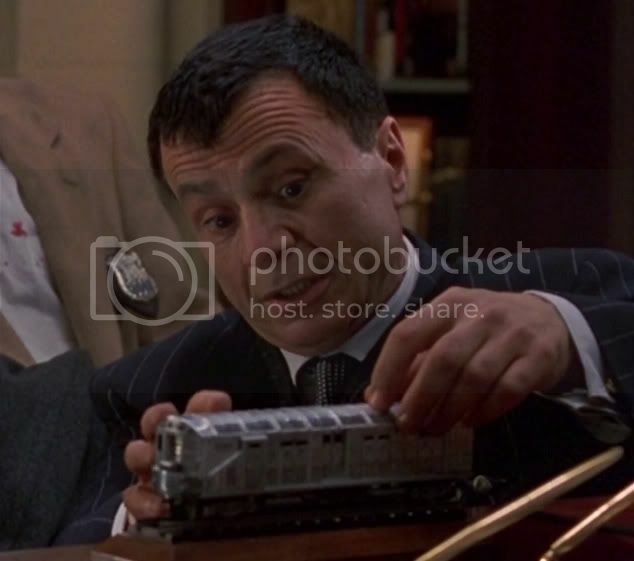 ^^ Mr Elmes has today issued a statement saying that an LNP government will DIRECT Queensland Rail to keep open the cross-town path over the North Coast Line at Pomona and make it safe. 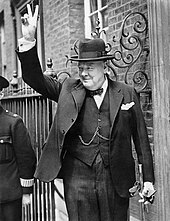 He also wishes to see plans for the new Pomona Railway Station to judge whether locals concerns about local heritage values being reflected in the design have been met. There might be some scurrying among QR staff about both issues if the LNP attains government after 25 November 2017. One day after Mr Elmes said an LNP government would direct QR to maintain and make safe the pedestrian crossing, construction tape has appeared with the words 'danger' and blocking access to the station from Station Street (the town side entrance). The tape must have gone up overnight, according to morning walkers and joggers. There has been no communication with the public about this action ... no notification to schools that kids riding their bike or walking to the local high and primary schools will have to go a different way tomorrow ... no signs showing alternative routes etc. The closure means either that this is the start of works to close the path permanently, as was proposed by QR in May, or that the path has been closed while works are carried out to make it safe. Either way, a week's notice, or any notice at all, that the path will be closed would have been a courtesy. Locals are angry about being kept in the dark on this. I suspect it is a response to the statement from Mr Elmes. An act of political bastardy IMHO. See pic of taped-up crossing on the dontdividepomona Facebook page. One of the comments does say it has been removed. I feel like someone (from the public) put it up as they don't want the crossing to remain open. Just a thought. The photo doesn't seem like the council or any level of government would have done it, very tacky and they would have put in a temporary fence rather than a lot of tape strung across in random directions. Also, there would be signs (if the government put it up) as to why. And they wouldn't have done it in the middle of the night either. Yep, looks very much like an anti-Elms stunt of sorts. Upon reflection, QR would not take action to close the path this way during the period when caretaker conventions apply. That doesn't even fit into QR's OH&S Procedures. After listening to community feedback, Minister for Transport and Main Roads Mark Bailey said Queensland Rail (QR) will retain the current pedestrian crossing at Pomona station. Minister Bailey said he wanted to assure locals the crossing would remain, but that it would require a number of safety upgrades. “QR put a number of options forward, one of which was to close the crossing, but after public consultations the message was loud and clear that people wanted the crossing to stay,” Mr Bailey said. “Safety is always our number one priority, and as the crossing is situated on a curved section of railway, a number of possible safety upgrades will need to be completed. One of the safety concerns is there is currently inadequate sight distance for approaching trains, and while I appreciate there have been no serious incidents to date, QR needs to put plans in place to safeguard the community and ensure this remains the case. “While design work is yet to be undertaken, the upgrade may include the installation of audible and visual alarms, footpaths and signage. I understand locals feel passionately about the future of the crossing, its historical significance to the town and its role in promoting walkability. QR is committed to working with the community and delivering a solution which balances the need for safety with providing a crossing that meets the town’s requirements now and into the future. QR CEO Nick Easy said they had been overwhelmed with the community’s feedback regarding the pedestrian crossing – 100 per cent of which called for the crossing to be retained and upgraded. “Of 148 submissions received during community consultation in August this year, 100 per cent of feedback indicated a preference for the crossing to be retained and upgraded to ensure walking connectivity remains in place at this location,” Mr Easy said. A great win for common sense and community. “Safety is always our number one priority, and as the crossing is situated on a curved section of railway, a number of possible safety upgrades will need to be completed. “One of the safety concerns is there is currently inadequate sight distance for approaching trains, and while I appreciate there have been no serious incidents to date, QR needs to put plans in place to safeguard the community and ensure this remains the case. “While design work is yet to be undertaken, the upgrade may include the installation of audible and visual alarms, footpaths and signage. “I understand locals feel passionately about the future of the crossing, its historical significance to the town and its role in promoting walkability. “QR is committed to working with the community and delivering a solution which balances the need for safety with providing a crossing that meets the town’s requirements now and into the future. QR CEO Nick Easy said they had been overwhelmed with the community’s feedback regarding the pedestrian crossing – 100 per cent of which called for the crossing to be retained and upgraded. “Of 148 submissions received during community consultation in August this year, 100 per cent of feedback indicated a preference for the crossing to be retained and upgraded to ensure walking connectivity remains in place at this location,” Mr Easy said. “QR has taken this feedback on board, in addition to consulting with Noosa Shire Council, community groups and local businesses, and has made a decision to upgrade the crossing to ensure it meets national rail safety standards, while retaining connectivity at this site for local pedestrians.